Sit Back and Let Cirque du Soleil's 'Paramour' Lift You Up! Cirque du Soleil has already conquered Las Vegas with a handful of successful, long-running shows there. They are known worldwide for their hallmark: spectacular, acrobatic aerial stunts, big glitzy sets and costumes as well as inventive dance numbers. They have been dazzling audiences for decades. New York, however, is different. The team behind Cirque du Soleil shows are the Shakespeares of acrobatics but their simple, tired storylines could have been written by a middle-schooler. 'Paramour' is the show they wanted to use to change that perception and take New York by storm. It features everything from identical twins' astounding acrobatic aerial feats (by Andrew and Kevin Atherton, pictured) to a man and woman who perform a beautiful aerial ballet to leaping flights of fancy off a giant seesaw to a man who juggles an umbrella with several large rings to hoop dancers to an amazing rooftop trampoline chase scene (with costumes straight out of 'Guys and Dolls'). Each is a joy to behold. And, if all this isn't enough, there is also a scene with a high tech yo-yo and one with flying lampshades (I'm not kidding). It's all really fun. A heckuva lot of fun. So much was so impressive- except, alas, the story. That continues to be Cirque du Soleil's Achilles heel. 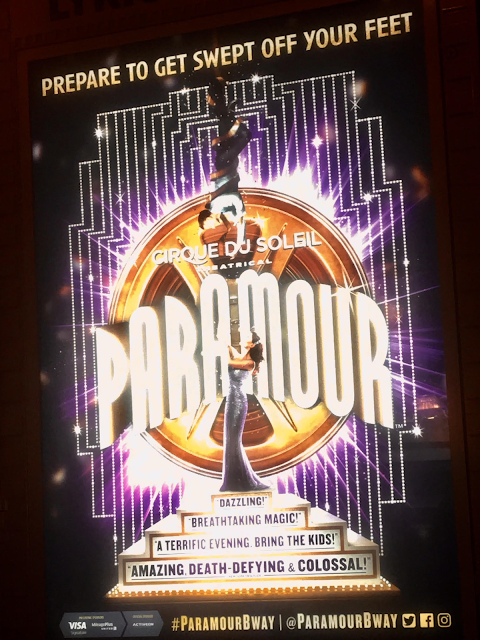 I have seen three other Cirque shows (all in Las Vegas, where this kind of "style over substance" is more accepted) but the Cirque executives have made it clear they want 'Paramour' to be more like a Broadway musical, with the thinking being if they want to be on Broadway they need a "Broadway" show. Set in the mid-1950's, 'Paramour's' clichéd storyline is about a Hollywood director named AJ, played by Jeremy Kushner (who also serves as narrator but comes across more like a circus ringmaster- which is, of course, fitting), in search of a star who he (surprise!) instantly finds in a speakeasy nightclub. She's played capably by Ruby Lewis, who also possesses a powerful voice. AJ, of course, immediately changes her name from Vera to Indigo. We then follow him making her into a star and the ensuing predictable love triangle between him, Indigo and Indigo's friend the songwriter, Joey (Ryan Vona). But these three are not the real stars of the show. Those would be the aerialists, acrobats, set designers, choreographers and the musicians. 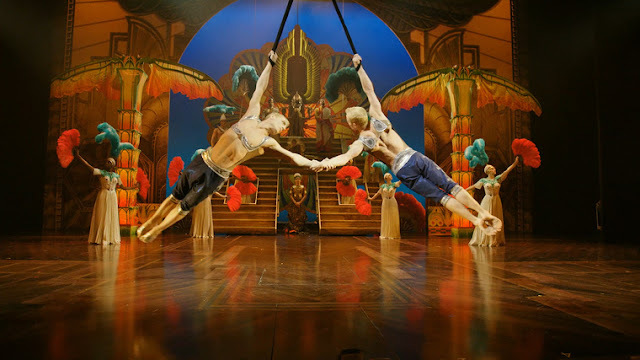 The music manages to match the amazing acrobatics beautifully with a majesty and power that enhance the effect of the performers' theatrics and fit the mood of each scene. I was told by a production staffer that the 9-piece orchestra (which sounds like twice that size) is comprised of all Broadway pit veterans except the music director, Seth Stachowski, who is a Cirque veteran and plays several instruments during each performance. 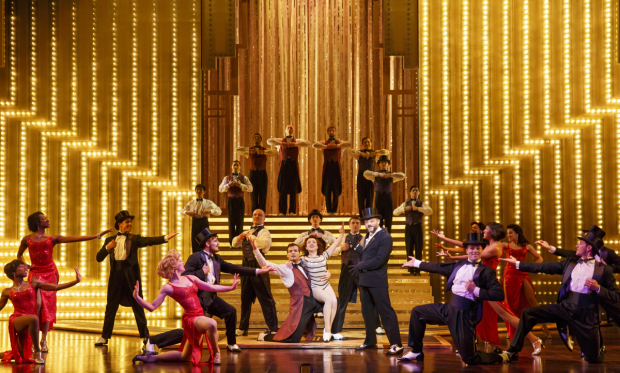 You won't leave the theater humming any of the songs (the trite lyrics are also not a Cirque strong suit) but, with the incredible surround-sound at the Lyric Theatre, the music enhances the experience of the stunts. I can't say the same for the character of the mute Cooper (Nate Cooper), in a Harpo Marx-type role which just offered needless doses of low-brow pratfall humor, often on roller skates... for some reason. The video projections were a curious combination of high and low definition, perhaps to give you a feeling of Old Hollywood. So is this a "Broadway" show? Well, it is playing in a Broadway house so, technically, it is considered a Broadway show. But does that really matter? For years people have been saying Broadway needs to expand the types of shows it offers and perhaps this is one example of how that can be done. While it's not completely successful, it is fascinating and a lot of fun to watch. A few words about the Lyric Theatre: Walking into it reminded me of a casino. And I mean that in a good way. The attention to service, a remarkably wide selection of concessions goodies and optional levels of VIP service (called The Ambassador Experience) all add to a Las Vegas-style atmosphere that is a refreshing change from the stodgy old ways of most Broadway houses. And the state-of-the-art surround sound system was spectacular as well- another notable difference from other Broadway shows (with the exception of 'The Encounter'). To sum up the debate about whether this is a Broadway musical or just a circus show: You don't believe the story for a minute but there is so much spectacle that the thin plot doesn't bother you. At least that would be the suggested approach to take here- just relax and be amazed by all the talented performers doing their aerial stunts. They won't let you down.